Add this new guide to your shelf of farm access resources! While each situation is unique, most options for accessing land fall into these categories. A farmer’s values and goals, combined with practical realities, will likely match up with one or more methods within each category. What arrangements might work for me? What are the advantages and disadvantages of this method for my current situation? Methods are described and assessed against a set of criteria including security, affordability, flexibility, and equity. Each method is analyzed and “scored” based on the extent to which it addresses each variable. For example, a short-term lease is scored high on flexibility but low on security. The guide also explores the partners and stakeholders, legal and financial arrangements, equity and legacy provisions, challenges and responsibilities, advantages and disadvantages of each method. 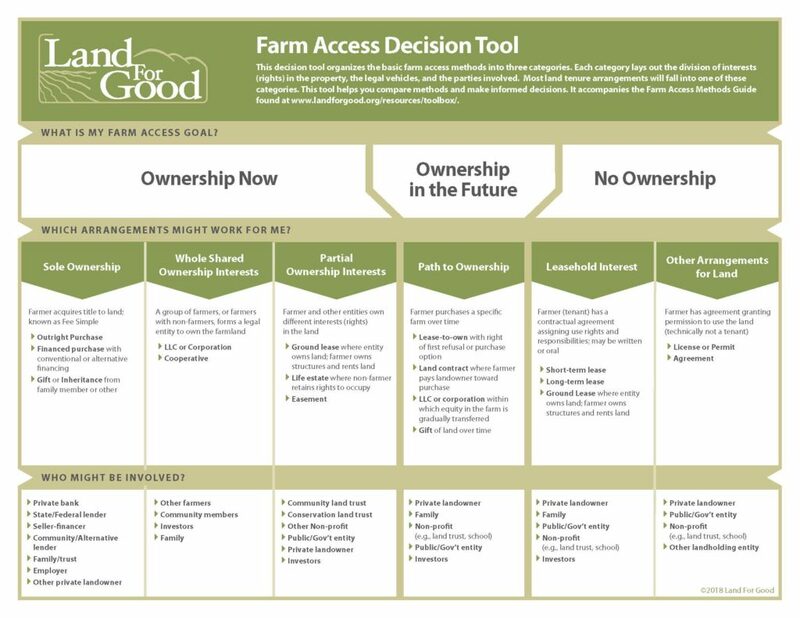 The guide’s Farm Access Decision Tool compares the three categories of farm access methods in terms of property rights, legal vehicles and relevant stakeholders. 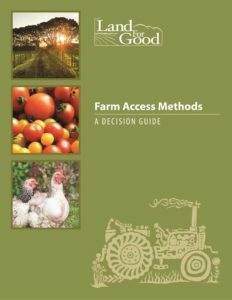 Farm Access Methods: A Decision Guide was developed in response to calls from farmers for credible tools to aid farmers in making decisions about land access options and arrangements. The guide was developed by the Tenure Innovations Task Force of Land For Good’s Land Access Project, Phase II. Beginning farmer trainers and advisors will also find this comprehensive guide a useful addition to their curriculum and consulting.